November 22, 2016 – A thrilling ride is about to begin for NASA’s Cassini spacecraft. 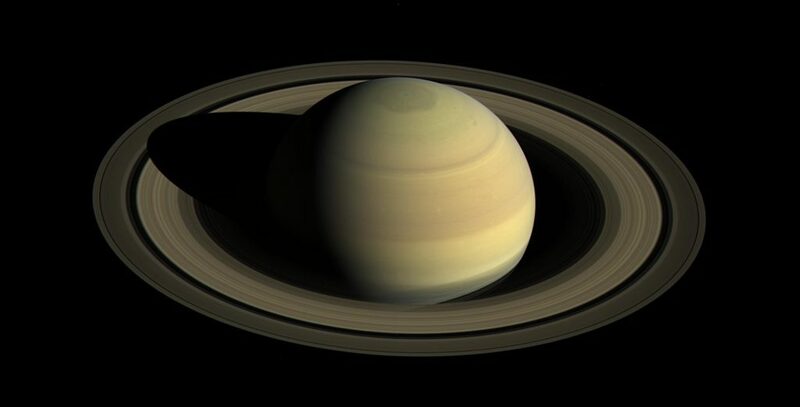 Engineers have been pumping up the spacecraft’s orbit around Saturn this year to increase its tilt with respect to the planet’s equator and rings. And on November 30, following a gravitational nudge from Saturn’s moon Titan, Cassini will enter the first phase of the mission’s dramatic endgame. Between Nov. 30 and April 22, Cassini will circle high over and under the poles of Saturn, diving every seven days — a total of 20 times — through the unexplored region at the outer edge of the main rings. On many of these passes, Cassini’s instruments will attempt to directly sample ring particles and molecules of faint gases that are found close to the rings. During the first two orbits, the spacecraft will pass directly through an extremely faint ring produced by tiny meteors striking the two small moons Janus and Epimetheus. Ring crossings in March and April will send the spacecraft through the dusty outer reaches of the F ring. “Even though we’re flying closer to the F ring than we ever have, we’ll still be more than 4,850 miles (7,800 kilometers) distant. There’s very little concern over dust hazard at that range,” said Earl Maize, Cassini project manager at JPL. The F ring marks the outer boundary of the main ring system; Saturn has several other, much fainter rings that lie farther from the planet. The F ring is complex and constantly changing: Cassini images have shown structures like bright streamers, wispy filaments and dark channels that appear and develop over mere hours. The ring is also quite narrow — only about 500 miles (800 kilometers) wide. At its core is a denser region about 30 miles (50 kilometers) wide. Cassini’s ring-grazing orbits offer unprecedented opportunities to observe the menagerie of small moons that orbit in or near the edges of the rings, including best-ever looks at the moons Pandora, Atlas, Pan and Daphnis. Grazing the edges of the rings also will provide some of the closest-ever studies of the outer portions of Saturn’s main rings (the A, B and F rings). Some of Cassini’s views will have a level of detail not seen since the spacecraft glided just above them during its arrival in 2004. The mission will begin imaging the rings in December along their entire width, resolving details smaller than 0.6 mile (1 kilometer) per pixel and building up Cassini’s highest-quality complete scan of the rings’ intricate structure. The mission will continue investigating small-scale features in the A ring called “propellers,” which reveal the presence of unseen moonlets. Because of their airplane propeller-like shapes, scientists have given some of the more persistent features informal names inspired by famous aviators, including “Earhart.” Observing propellers at high resolution will likely reveal new details about their origin and structure. And in March, while coasting through Saturn’s shadow, Cassini will observe the rings backlit by the sun, in the hope of catching clouds of dust ejected by meteor impacts. During these orbits, Cassini will pass as close as about 56,000 miles (90,000 kilometers) above Saturn’s cloud tops. But even with all their exciting science, these orbits are merely a prelude to the planet-grazing passes that lie ahead. In April 2017, the spacecraft will begin its Grand Finale phase. During its grand finale, Cassini will pass as close as 1,012 miles (1,628 kilometers) above the clouds as it dives repeatedly through the narrow gap between Saturn and its rings, before making its mission-ending plunge into the planet’s atmosphere on September 15. But before the spacecraft can leap over the rings to begin its finale, some preparatory work remains. To begin with, Cassini is scheduled to perform a brief burn of its main engine during the first super-close approach to the rings on December 4. This maneuver is important for fine-tuning the orbit and setting the correct course to enable the remainder of the mission. To further prepare, Cassini will observe Saturn’s atmosphere during the ring-grazing phase of the mission to more precisely determine how far it extends above the planet. Scientists have observed Saturn’s outermost atmosphere to expand and contract slightly with the seasons since Cassini’s arrival. Given this variability, the forthcoming data will be important for helping mission engineers determine how close they can safely fly the spacecraft.